Sometime before 1689, Stephanus Van Cortlandt (d. 1700) erected a water-powered mill on his property, roughly at the corner of present day Dikeman and Van Brunt Streets. "The mill-pond, which was formed by damming off the creeks and natural ponds in the adjoining marsh, contained in 1834 over forty-seven acres of drowned marsh, but it is long since filled up and obliterated by the march of modern improvements." In 1712 Van Cortlandt's heirs sold the mill and property to Mattias Van Dyke.
" 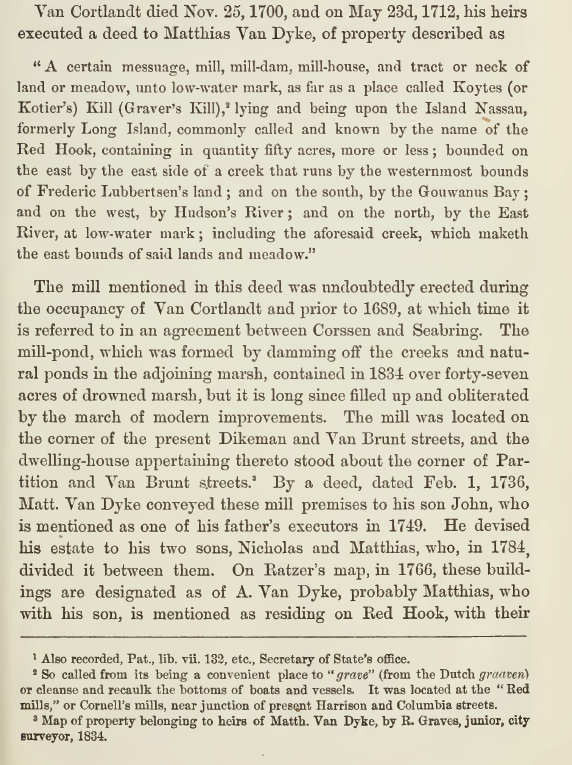 A certain messuage, mill, mill-dam, mill-house, and tract or neck of land or meadow, unto low-water mark, as far as a place called Koytes (or Kotier's) Kill (Graver's Kill), 2 lying and being upon the Island Nassau, formerly Long Island, commonly called and known by the name of the Red Hook, containing in quantity fifty acres, more or less ; bounded on the east by the east side of a creek that runs by the westernmost bounds of Frederic Lubbertsen's land ; and on the south, by the Gouwanus Bay ; and on the west, by Hudson's River ; and on the north, by the East River, at low-water mark ; including the aforesaid creek, which maketh the east bounds of said lands and meadow." 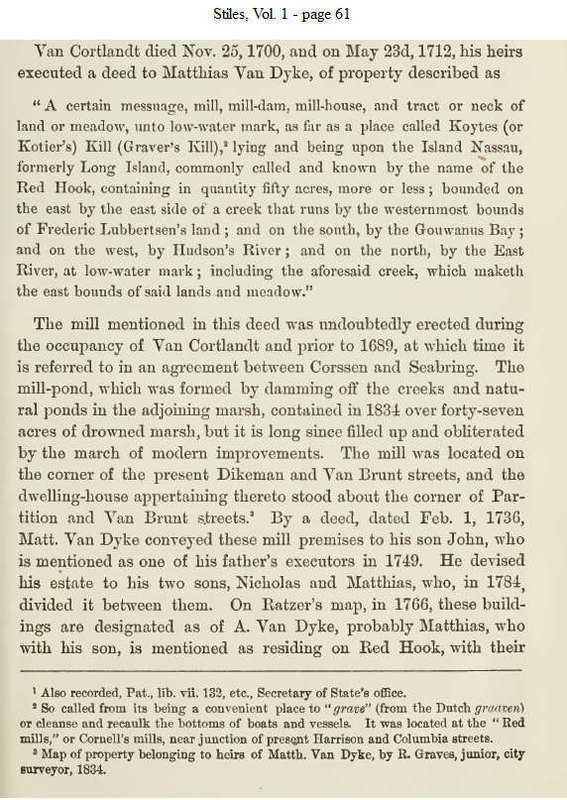 The mill mentioned in this deed was undoubtedly erected during the occupancy of Van Cortlandt and prior to 1689, at which time it is referred to in an agreement between Corssen and Seabring. The mill-pond, which was formed by damming off the creeks and natural ponds in the adjoining marsh, contained in 1834 over forty-seven acres of drowned marsh, but it is long since filled up and obliterated by the march of modern improvements. The mill was located on the corner of the present Dikeman and Van Brunt streets, and the dwelling-house appertaining thereto stood about the corner of Partition and Van Brunt streets. By a deed, dated Feb. 1, 1736, Matt. Van Dyke conveyed these mill premises to his son John, who is mentioned as one of his father's executors in 1749. He devised his estate to his two sons, Nicholas and Matthias, who, in 1784, divided it between them. On Ratzer's map, in 1766, these buildings are designated as of A. 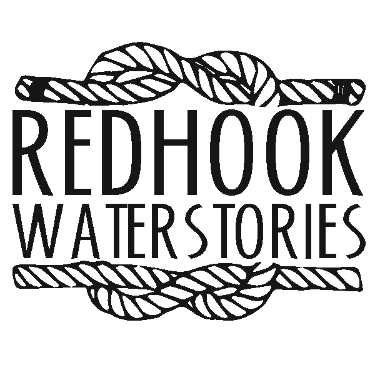 Van Dyke, probably Matthias, who with his son, is mentioned as residing on Red Hook, with their respective families, during the Revolutionary war, and were described as " good staunch, Whigs and very clever folks." At the time of the battle of Long Island a fort was erected here, named Defiance, and mounting four 18-pounders, en barbette. The Nicholas Van Dyke mill, which was erected after the date of Ratzer's map, on the same pond, was located on the ground now bounded by the present Van Brunt and Richards, Van Dyck and Partition streets ; the dwelling-house being on the northeast corner of Van Dyck and Van Brunt streets. This mill was called the " Ginger Mill," by which name it is yet distinctly remembered by some of our oldest citizens.